Teriyaki Meatballs – Siren, refined. There are some days when I don’t feel like making a big meal, but also don’t have the heart to tell my husband to fend for himself. For days like this, I have a couple of super easy recipes in my arsenal that are made up of ingredients that I always have on hand. This is a recipe that I have turned to many times when I just needed to make something good. Tip – These meatballs freeze really well. Place the uncooked meatballs on a baking sheet lined with waxed paper or parchment and place in the freezer for a few hours until completely frozen,then place frozen meatballs into a freezer-safe zip lock bag. In a small saucepan, mix the soy sauce, 1 1/2 cups water, ginger, garlic powder, brown sugar, and honey together. Bring to a simmer over medium heat, stirring periodically. In a separate small bowl, dissolve the cornstarch into the 1/2 cup cold water. Add the cornstarch mixture to the saucepan and stir until thickened. Set sauce aside. For the meatballs, in a large bowl, combine all the meatball ingredients except for the ground beef and mix well. Add the ground beef and mix until combined (do not overmix!). Form ground beef mixture into 1 to 1 1/2-inch meatballs. In a nonstick skillet, heat two tablespoons oil over medium heat until the oil is rippling and hot. Add the meatballs to the hot skillet and brown on all sides, turning with a pair of tongs. When the meatballs have browned, pour the sauce over the meatballs and gently turn the meatballs to coat them in the sauce. Simmer the meatballs and sauce over medium heat until the meatballs are cooked through and the sauce is thick and smooth (if the sauce becomes overly thick, add a tablespoon of water at a time to thin), about 5-10 minutes, turning the meatballs every two or three minutes to ensure even cooking. 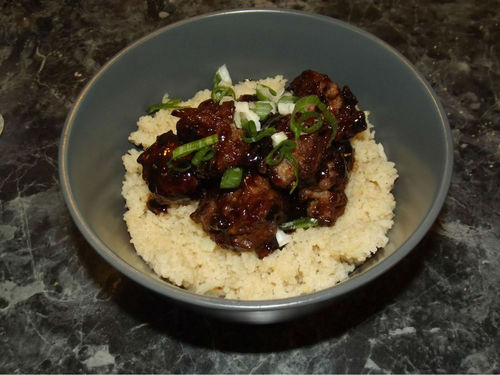 Serve over rice or couscous.